Our quantum professor worked out the Kepler-Coulomb equation earlier this week and ended with a cryptic remark about SO(4). A little bit of digging led to a presentation about the details from the University of Minnesota math department[pdf]. It turns out that Fock did a Fourier transform of Schrodinger's equation into momentum space and saw that the resulting integral kernel looked like the projection of a sphere onto a 4 dimensional hyperplane. He then saw that Schrodinger's equation is simply the Laplace equation in this space. I hope in the future to write something more complete on the whole matter, but with finals coming up, I'll just add a few notes and references. Fock's original article on all this is written in German. 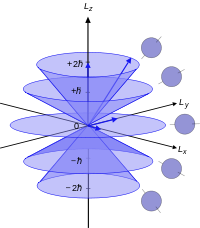 However, the author of the above mentioned presentation, Jonas Karlsson was kind enough to point me to Linearity, Symmetry, and Prediction in the Hydrogen Atom (Undergraduate Texts in Mathematics) . Where the entire article is translated into English. A book that I mentioned earlier in the week, Hecht's Quantum Mechanics (Graduate Texts in Contemporary Physics), also briefly discusses Fock's findings. One of these volumes, (apologies... I'm rather scattered and can't find the reference in any of them at the moment), points out that the azimuthal quantum number while once considered 'mysterious', can be more simply seen as the projection of a fourth dimensional variable into our three dimensional space. Scroll down for the Google Books excerpt from the Linearity book mentioned above. Great post. Anything to demystify the sometimes cryptic group symmetries in the world is appreciated! Thanks Tunafish! Hopefully more demystification will be coming in the new semester.